Otherwise I might forget it and then where will we be? As we mentioned, one reason that “Philosophy Is The Best And Most Noble Music” stems from what a fine art is. 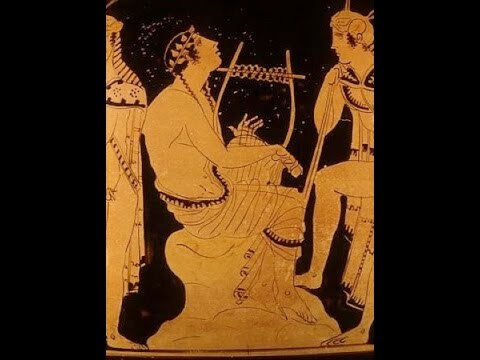 Philosophy Is The Best And Most Noble Music (which seems to be a kind of free translation of “ὡς φιλοσοφίας μὲν οὔσης μεγίστης μουσικῆς”) because of what music is. Another word for music is harmony. And harmony refers to, if nothing else, the bringing together in pleasant agreement various and different sounds. Thus to make harmony, or to make music, means to make agreement. This agreement might be between one note and the next in a melody (horizontally). Or the agreement could be between all the notes among the chords (vertically). Or both hopefully. To make music mean to make agreement! Now do you see how Music is like philosophy? Socrates devoted a life time to talking with people in an attempt to bring them to an interior agreement. The Dialogues are all examples of this. Someone claims to know something. Socrates, always interested in learning, engages him in a discussion in which Socrates ‘tests’ whether the claim to knowledge is really authentic. In most cases Socrates discovers that those who claim to know something do not in fact know what they claimed. And Socrates attempts, with patience and charity, to show each of these pretenders to knowledge that they really don’t know. How do you show someone who falsely claims to know something that he doesn’t know? The best way to do this, as Socrates teaches us, is to show a person that if he asserts one thing which contradicts other things about which he is more certain, then the assertion cannot be true. In other words, if someone has the truth then all of his ideas must be in agreement with one another. With the truth all things harmonize. With the truth all things are in harmony. With truth there is Music! And so what could be clearer? Music is the art which brings various sounds into harmony or agreement, Philosophy is the science in which our ideas and thoughts are brought into harmony; the method by which the entire intellectual life of man is brought into a beautiful agreement. Therefore Philosophy, as Socrates maintains, is the best and most noble music! This entry was posted in Music, Philosophy of Nature, Seven Fine Arts, Socrates and tagged disagreement, harmony, music, Socrates. Bookmark the permalink.